To demonstrate the concepts of the Imixs-Workflow Engine, the project provides a Web Sample Application based on JSF. The source code can be downloaded from GitHub. The following section gives you an overview how to build the sample application and how to deploy the application into an Application Server. We assume, that your are familiar with the concepts of Java Enterprise, JSF and Maven. This tutorial also refers the general steps needed to get the Imixs-Workflow engine up and running on different platforms. You will find more detailed information about deployment in the deployment guide. You will find the war file in the target folder of your working directory. a JAAS Security Realm to allow users to authenticate against the Workflow Application. Trouble Ticket Systems are commonly used in an organization’s customer support. So this will be a good example to start with. You can explore and customize this sample model using the Imixs-BPMN Modeler. You can also use any other Rest Client Tools to manage your models. E.g: Insomia or Postman. 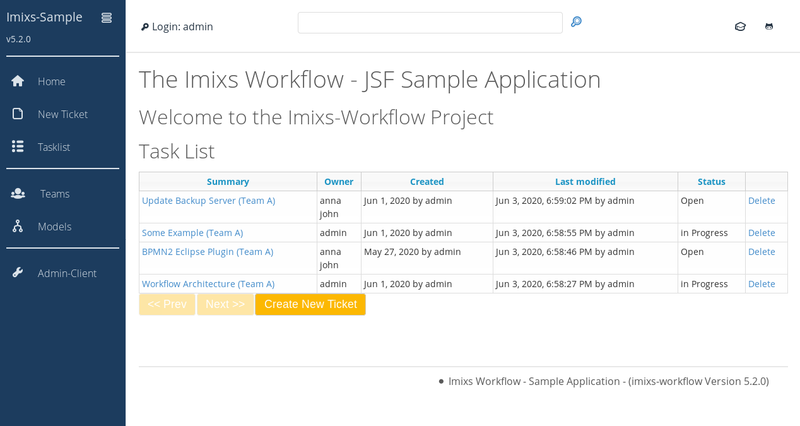 The Imixs-JSF-Sample application can be used as a starting point. You can add your own forms and views if you are familiar with the concepts of Java Enterprise, JSF and Maven.